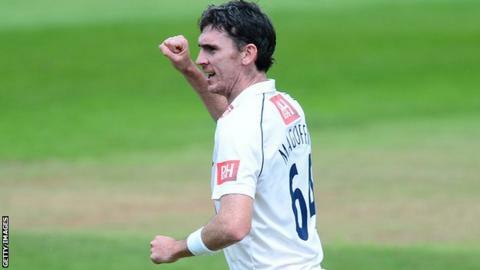 Sussex cricket manager Mark Robinson hopes out-of-contract seam bowler Steve Magoffin will sign a new deal. The 34-year-old Australian, who joined Sussex ahead of the 2012 campaign, took 72 Championship wickets at an average of 19.51 this season. "We've relied on him and he has been outstanding," Robinson told BBC Sussex. "We have to manage his overs, his spells and manage him around one-day cricket. He's not [contracted] yet but we hope him to be." Magoffin has been the cornerstone of the Sussex bowling attack since moving to Hove. He took match figures of 9-55 on his debut and went on to finish the 2012 campaign with 57 first-class wickets at an average of 20.05. The right-armer surpassed that total in 2013, picking up 63 wickets at 21.49. His stand-out performance came when he finished with match figures of 12-31 against Somerset. He is expected to remain at Sussex, although Robinson prefers to keep negotiations over new deals confidential. "Sometimes things might change but I don't believe or agree with announcing the release of players during the summer or, if you can help it, announcing who has signed or not signed," he said. "All it does is potentially give unease amongst the squad and cause undue speculation within the squad. "So far this summer I have managed to keep everything in-house and nice and private because you value everybody's welfare within the squad. You can't make decisions on certain players too early. "It's dangerous to get into those type of things but we know where we are with Steve."